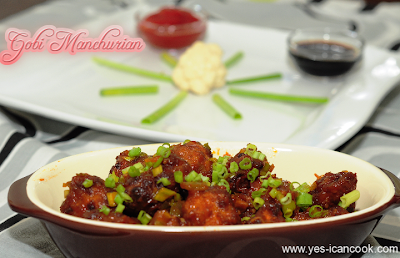 I really like Gobi Manchurian. I definitely order it whenever I go to dine at any vegetarian restaurant. My husband doesn't like it and would take just a bite that too if I insist. When I wanted to make Gobi Manchurian at home I browsed through a few recipes and finally chose this one to prepare and I am so so glad I did so. My husband ate half the manchurian and exclaimed how amazing it tastes. I would try the same recipe with fish and chicken soon. 1. 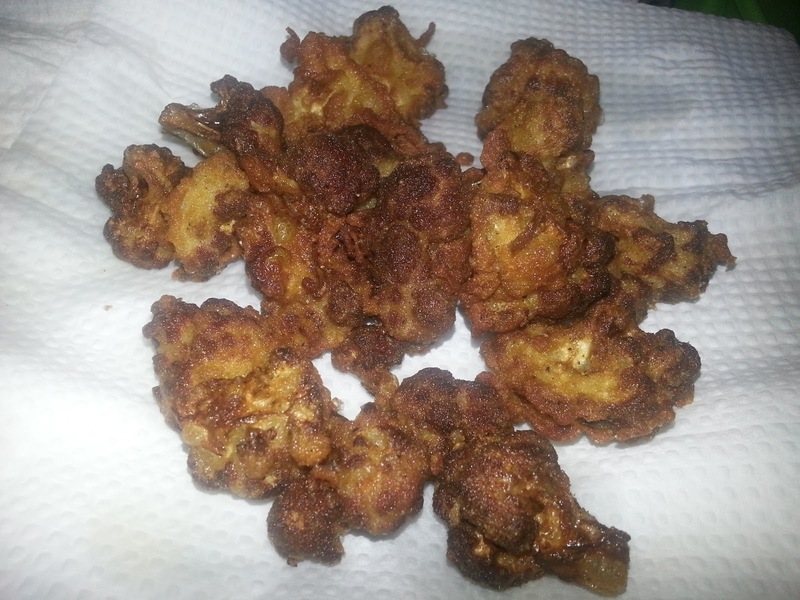 Cut cauliflower into bite sized florets. Wash well. 2. Bring water to boil in a saucepan. Add salt to it. 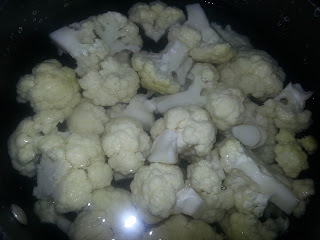 Turn off flame and add cauliflower florets to the water and keep it aside for 12 minutes. Remove from the water and keep aside. 3. In a mixing bowl add all purpose flour, cornflour, rice flour, ginger garlic paste, pepper and salt and mix well. 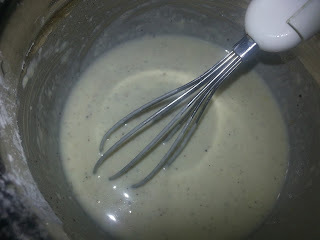 Add warm water as required to make a thick batter. 5. Dip the florets in the prepared batter and coat it well with the batter. 6. Drop one by one without over crowding in the hot oil. 7. Reduce the flame and deep fry till the florets are cooked. 8. Increase flame towards the end and fry till the florets turn golden brown. 9. Remove from oil and place on kitchen towels. Fry all the florets in the same way. 10. Heat oil in a vessel and add the minced garlic and fry for a few seconds. 11. Add ginger and fry for a few seconds. 12. Add the whites of the spring onions and fry for 4-5 minutes stirring constantly. 13. Add capsicum and fry for 3-4 minutes. 14. Add brown sugar and mix well. Reduce flame. 16. Add 4 Tablespoons of water and cook for 2 minutes. 17. Add the fried florets, increase the flame and mix well for 1-2 minutes. 18. Add the chopped greens of the spring onion and switch off flame. Thanks Priya. Appreciate your comments.